Map: Custom, Roxor? you betcha. Why playing tibia if there is a better tibia? Theotserver is a nostalgic server, developed by Colandus, Tufte and Wezza. It is probably the most advanced server that is ever created, and we will try to sort out all the features in this post. Instead of having 4 vocations, where the Sorcerer and Druid is 95% equal, we have merged those two into 1 vocation, the mage. The knight has been changed into a Warrior, while the paladin remains the same. This doesn't sound very revolutionary, but the unique thing about our system, is the Class-system. When you reach level 100, you will have to choose between 2 classes, depending on which vocation you are. Here is an overview of the different vocations, classes and promotions, and how it works. Pure damage. Death and fire as its elements. No support spells. Most powerful vocation, but weak alone. The support-class. Very few offensive spells, however, it has awesome healing abilities. It is the only vocation that can summon, and it can summon very strong elementals. Can go 100% invisible (for escapes and sneaks). Cannot use SDs, UE or other strong offensive attacks. The strong paladin. Lots of health, but less mana. Can only use spears as a weapon. Main feature: the reflection-spell. When this spell is used, all damage dealt on the Warden, will be reflected in a % depending on his level. Using bows and arrows for attacks. Low health, much mana and very fast. It is very precise, and can use a camouflage-spell which makes him into a tree. Your characters name and hp-bar will disappear, so you are impossible to notice. However, if you move, your camouflage will disappear. The aggressive warrior-class. Using two-handed weapons as its main attacking-force. Decent health, low mana but very fast. Can be compared to an Orc Berserker. Using an anger-system to gain extra power. You are gaining anger while taking damage. When you anger is full, you can unleash this into an anger-move. This will make you into a creature, depending on your level. You will now get more speed and higher melee-skills. The tank. Lots of health, but very low mana. It is the only class which can use shields stronger than wooden-shields. Using a one-handed weapon for melee-fighting. The Guardian is mainly for blocking. For spell-names, check the spell-book in-game or visit the website. Counter-Strike: Exactly the same as real Counter-Strike, just in 2D. Map is de_dust2. Team Capture the Flag: Same principle as Capture the Flag, but with 4 different teams. Open Battle: Players are split in two, teleported to a PvP-map. Team Open-Battle: Same as Open Battle, but with 5 teams. Last team standing. Castle-Conquer: Idea based on Hunteras system, with more features. # - Promotion requires a level-reset. Your level will be set to 1, however, you equipment and skills remains the same. You will now get more health and mana per level, and new spells will be available. Definitely worth it. Why should you get all your friends and start on Theotserver.com? • - The best vocation-system ever created for Tibia. Who knows? Some day CipSoft might come up with something similar to this system! • - Unique events such as Counter-Strike, Capture the Flag, Open Battle, Team-Battle and Castle Conquer. 5 in 1 better than 5 in 5, save time! • - Custom website designed by Wezza, with absolutely every information you will need about the server! Before you can choose your class, you must achieve level 100. The conqueror is the one of the two warrior-classes that deals extreme amount of damage in close-combat. It is fast and strong, and can be compared to an orc berserker. However, as with the paladin, the speed takes its costs, and that is the defense. The conqueror is not able to wear shields nor heavy armors. This means it needs good healing-support, but if it has this necessary support, it will with its strong two-handed weapon probably be the strongest class that exists. Through special equipment, the conqueror is able to increase its melee-skills magnificent. This means it can deal even more damage if it is equipped correctly. The Conqueror will also be the only vocation with the “anger-system”. This will give him special moves to increase his melee power and speed. The tank, the blocker, the meat wall. It wears a one-handed weapon, which gives him the ability to also wear a shield. The Guardian is also the only class who can wear magical shields, which gives him more health-points. Opposed to the conqueror, it will deal noticeable less damage and be much slower, however, it has the ability to wear very heavy and armored equipment which can protect it from any melee- or range-attacker. The guardian will have the highest amount of health, but also the lowest amount of mana. Aggressive spells is lacking, but it will have a small specter of defensive spells, such as the well-known “challenge”. The warden is the masculine paladin, and is strong enough to wear shields. It is neither precise, fast nor good ranged, but it deals very high damage to its enemies with a fairly nice amount of aggressive spells while it also has a few defensive ones. It has a decent amount of health, and he could have the role as a blocker in smaller battles, however, the guardian is preferred of course. The warden is mainly using spears for its attacks, and is not able to equip any types of bows. So, why would you ever choose a Warden? Well the answer is: The Reflection-spell. When the Warden casts its reflection-spell, it will be surrounded by a magical shield. Depending on the Wardens level, it will reflect a percentage of the damage enemies are dealing on him. Example: A mage casts a Sudden Death on the warden while the reflection is active. If the mage deals 1000 damage, a level 300 warden will be able to reflect up to 75% of all the damage, which means the mage will lose up yo 750 hp in return. The hunter is the light, smart and fast version of the paladin. Some people might consider the hunter as a cowardly weakling, but there is no doubt the hunter is one of the smartest classes out there. Bows are the hunters primary weapons, and it will be fast, precise and smart. The hunter will have the ability to use camouflage, which means it will be able to transform into a tree or another object in its surroundings and totally disappear. While being in camouflage-mode, it will not be able to move. If it does so, the camouflage will disappear. Of course, the hunter has weaknesses too. It will not be able to wear any armor made of noble metal, only leather is fitting the weak hunter-body. A hunter is not strong enough to lift a shield, and if a warrior gets close to a hunter on low mana, it can just bury it selves. When in danger the hunter can stun his enemies for a few short seconds. The sorcerer is the class that has focused most on one thing, and that is pure power. A sorcerer has a low amount of defensive abilities and support-spells for himself. He will not be able to support his friends; the sorcerer is one piece of pure evil. It has death and fire as its only elements, and it will turn its enemies into ash and dust. The sorcerer uses its death-element for focused damage, known as the “sudden death”. However, the “sudden death” is not only 1 attack, it is a large collection of different death attacks that is so powerful it goes under the category “sudden death”. The fire-element is used for area damage. With those attacks, it will deal high damage to enemies in its surroundings, with a cruel burning after-attack that only can be cleansed druids or water. Have you ever thought of being able to go fully invisible? Or maybe you’ve missed a vocation with its power based on summoning, support and intelligence? Well, here is the druid. A druid has the ability to go fully invisible, and as long as its not being damaged he will stay unnoticeable. This ability will be useful in sneak attacks and escapes. Summoning is one of the main characteristics of a druid. It will be able to summon very strong monsters, depending on its level. The summons you will be able to summon as a druid, are elementals. You have fire, energy and earth elementals. With a higher level, you will be able to summon stronger elementals, and each elemental-type will have advantages and disadvantages. For example will an earth elemental be mainly for blocking, while an energy elemental mainly for damage. Before you can summon an energy elemental, you will have to choose this element at your temple. To choose the element you want, you will have to walk on the element-base of this element. Druids will of course, also be the masters of healing. Every team will need a skilled druid in its party to heal the members. Druids will be able to cast area healing-spells that can be adjusted to only heal party members. It will be able to heal single players, both with runes and words and of course also be able to heal mana-points. As you see, the druid is full of nice features, however, as all the other classes, it has downsides too. The downside of a druid, is the ability to attack. The druid will not be able to cast any spells or runes dealing damage. The only way a druid will be able to deal damage, is via summons and wands. Druids will be the only class that is able to wear wands, but it is also the only way it can attack by itself. Those wands will be obtained in quests and will deal enough damage to kill weak monsters alone. However, there is one other way a druid can deal damage, and that is by collecting sacred power gained by healing your friends. When your sacred power has reached the limit, you will be able to unleash huge amount of power in one single attack. As you see, a druid is be very hard to level up, especially alone, but if you have a strong druid, you will probably be the most wanted person on the server. Not sure how to choose your way of playing? Well here we will try to compare it with what you are used to. What we have done, is to enlarge the differences between the vocations that currently exists in Tibia. However, the basics are still the same, so choosing your vocation should be very easy, since the only difference here is that we have merged the Sorcerer and the Druid. When it comes to races, things started to get a bit more complicated. Now you must choose how you want to play the game. In real tibia, it doesn't really matter if you chose a sorcerer or a druid, since they are almost capable of doing the same things. What we have done here, is to give all the different races a bunch unique skills. If you want to have a more supporting character, you choose the druid since it is very good at summoning and healing. You can also go full invisible with a druid, which is awesome for escapes! If you want more of a solo-play, you should go for a sorcerer which is good at damaging on it's s own. In real tibia, there is 1 melee-fighter, and that is the knight. In Whytibia.com, there are 2 different types of melee-fighters: One blocker, and a damage dealer . The guardian has huge health, a lot of cap and the ability to wear shields. The conqueror on the other hand, is more like an orc berserker. He is fast and can wear two-handed weapons to deal high damage. @Patrycjusz Glad you like it, welcome aboard! Definitely a great server, playing from the United States and I dont lag at all. 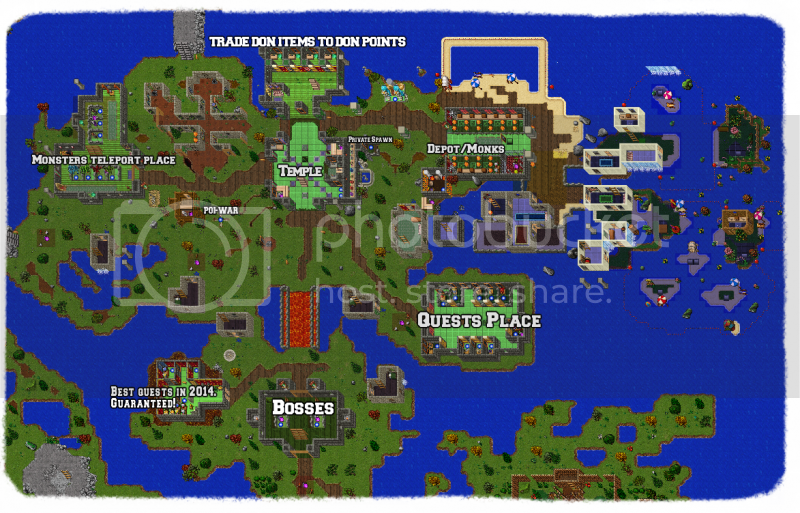 Great map, tons of quests and the Admin Wezza is a great dude. Highly recommend playing. Made 4 different accounts with a range of different account names, could log into the website just fine. Zero luck logging in the client, I could access the spectator login though. Any help @Wezza ? @podge22 I've seen a dude from UK creating 4 chars, was wondering where is he in game haha, have you tried Tibia client 8.60 and otland ip changer? You set up IP changer correctly?